Baylor might have had the 1915 football championship on the Carroll Field sign, too, but a transfer rule in the newly formed Southwest Conference meant that Baylor had to forfeit the title. 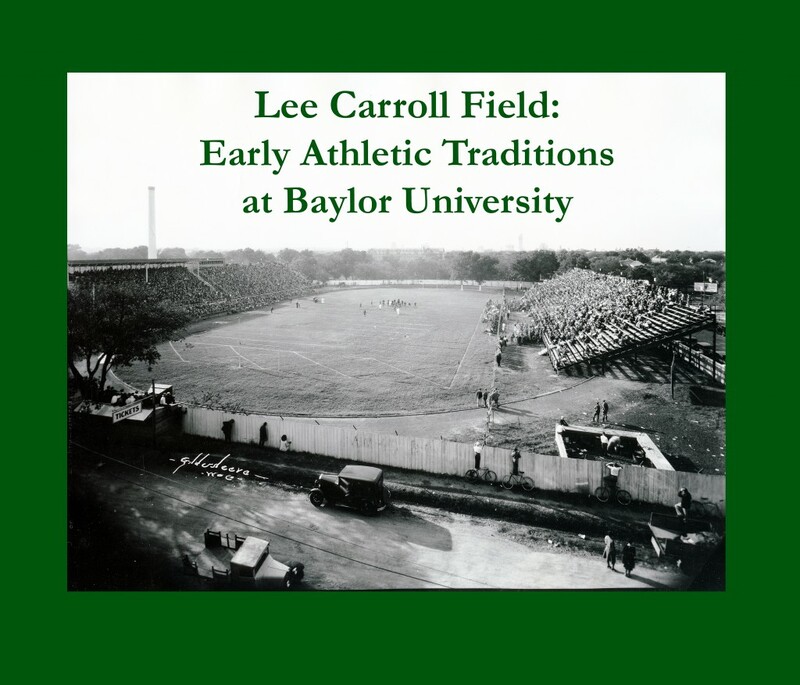 General photo files–Baylor–Buildings–Carroll Field. My knowledge of baseball largely comes from six years of watching my brother’s Little League team. I’m not an authority by any means, but I’ve been surprised at how much lingo I managed to soak up. But when I set out to learn more about Denney Wilie, Baylor’s first baseball player to make it to the majors, I was stumped by repeated references to the “twirlers” and their role in winning games. Members of the 1910 Baylor baseball team gather for a team photo. Note Carroll Library and Chapel, with its original dome, on the left of the photo. To me, a Baylor twirler is a Golden Girl, but it turns out that pitchers are “twirlers” too! The term makes sense, especially since when Denney was “twirling,” baseball was in its Deadball Era. Baseballs were used till they were soft, and spitballs were legal—so connecting with the ball, let alone hitting a home run, was difficult. A powerful pitcher who had some tricks up his sleeve would be a great asset to his team as he “twirled” the ball across the plate. And Denney certainly was a strong member of the Baylor team—in 1911, before he left Baylor to join the St. Louis Cardinals, Denney captained his team to the state championship! Of course, he had some help—the athletics program was growing and there were many strong players at Baylor. (Baylor baseball started in 1902.) 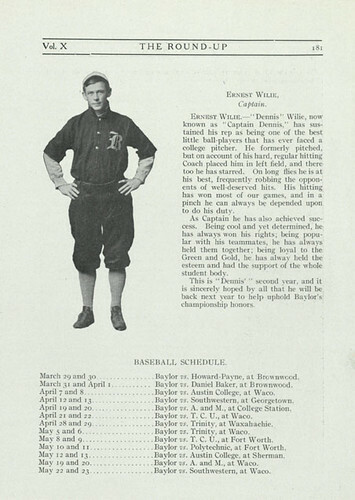 Denney also came from an athletically inclined family—his brother, Charles Lee “Cap” Wilie attended Baylor from 1904-08 and was a baseball star in his own right. Both brothers played and excelled in football at Baylor too. But it was Ernest Dennis “Denney” Wilie who would turn his baseball talent into a career. Denney Wilie led the way for future Bears who have competed in major league baseball. After Baylor’s 1911 state championship, Denney left the university to join the St. Louis Cardinals, where he was an outfielder in 1911 and 1912. According to Baseball-Reference.com, in 1915 he played for the Cleveland Indians, then went on to play for the Oakland Oaks in the Pacific Coast League from 1915-23. Oddly, the Lariat didn’t cover the momentous event of Baylor’s first student to play major league baseball—maybe they were disappointed that he didn’t return to complete his time at Baylor. Nevertheless, Denney Wilie holds the distinction of being the first of 39 (to date) Baylor athletes to compete in Major League Baseball. This year’s draft picks and current athletes in the majors uphold a proud history of excellence in baseball at Baylor!